Welcome! Already a member? Log In Here! An effective weight-loss program must include increased energy expenditure in addition to reduced dietary intake. The effect of exercise may differ according to gender and genetics, so these factors must be considered when making prescriptions for the amount, intensity and duration of exercise necessary for successful long-term weight loss. An RD is a healthcare professional who provides nutrition services for prevention and disease managment. 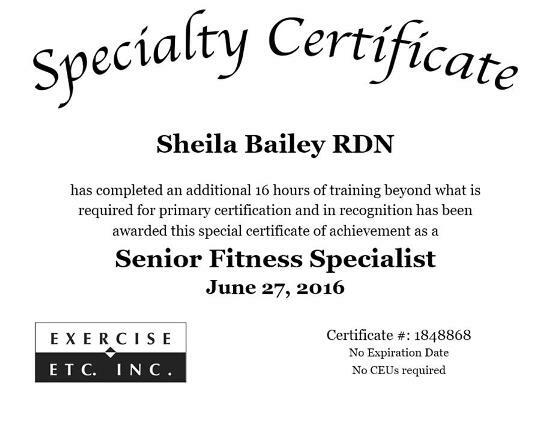 Sheila Bailey also specializes in weight management and passionate about her mission of helping people through certification with the American College of Sports Medicine as a Health/Fitness Instructor. For maximizing "fat burning" the key is to exercise as long as possible at as high an intensity as posssible in order to maximize calorie burning this can be easily accomplished through training for a sport such as a 5k, 10k or even a marathon. 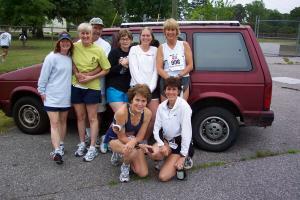 Sheila offers help with training for an event with group exercise or individual training. Plus nutrition assessments to help with maximizing weight loss without compromising health. Completed a minimum of a bachelors degree at a US regionally accredited university or college and course work accredited or approved by the Accreditation Council for Education in Nutrition and Dietetics (ACEND) of the Academy of Nutrition and Dietetics. Completed an ACEND-accredited supervised practice program (Internship) at a health-care facility, community agency, or a foodservice corporation or combined with undergraduate or graduate studies. Typically, a practice program will run six to 12 months in length. Passed a national examination administered by the Commission on Dietetic Registration (CDR). For more information regarding the examination, refer to CDRs website at www.cdrnet.org. Completed continuing professional educational requirements to maintain registration. Private practice, working under contract with health-care or food companies, or in their own business. RDNs may provide services to foodservice or restaurant managers, food vendors and distributors or athletes, nursing home residents or company employees. Registered dietitian nutritionists who are members of the Academy are not only food and nutrition experts  they are leaders in the field of dietetics. Every one of the Academy's wide array of member benefits is designed to advance their knowledge and skills and enhance their networking opportunities.